Somewhere in the sea of 17,000-plus people that packed Bridgestone Arena Wednesday night for game one of the Predators opening round playoff series against the Stars sat the team’s most important cheering section. NASHVILLE, Tenn. (WTVF) — Somewhere in the sea of 17,000-plus people that packed Bridgestone Arena Wednesday night for game one of the Predators opening round playoff series against the Stars sat the team’s most important cheering section. The Predators’ wives and girlfriends offer yearround and often around the clock support, mostly behind the scenes. But Ida Bjornstad and Julie Turris are giving their voice to a new hockey podcast, adding their unique perspective to the hockey conversation. “There are so many stories that need to be told,” Bjornstad said when I spoke with her this week. Bjornstad grew up on hockey and was a sports broadcaster back in her native Sweden. But launching a hockey podcast required a little coaxing of the normally more reserved Turris. “She a natural,” Bjornstad said. “Because I like to talk,” Turris chuckled. Ida is the fiancé of defenseman Matthias Elholm and Julie is the wife of center Kyle Turris. 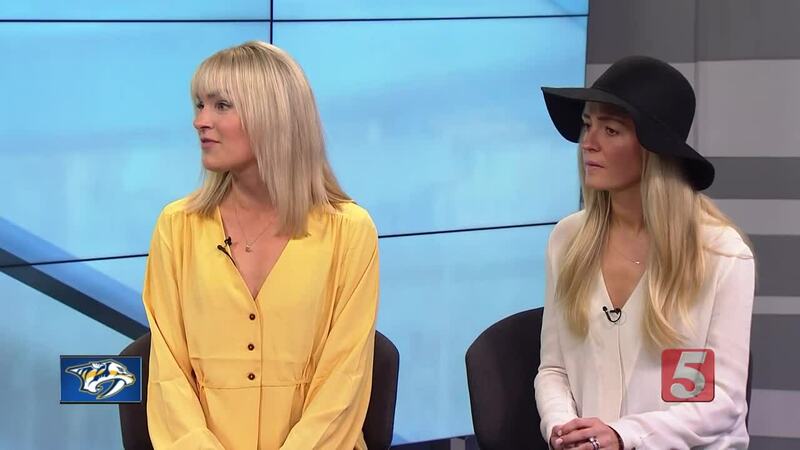 Together they host “Off Ice with Ida & Julie”. On the podcast they will talk about everything from pregame meals and rituals to more serious matters. All in an effort to give fans a glimpse behind the scenes of a hockey family’s quest for the Cup. Thirteen episodes in they’ve generated quite a following that includes their hockey playing partners. Both Mattias and Kyle are quite supportive of the ladies, but Julie says there has been one critique. The podcasts drop on Wednesdays and will continue for however long the Predators’ playoff run lasts. It’s a welcome addition to their workload during the most exciting time of the year. And when it comes to the Stanley Cup Playoffs, who better to be able to grasp the true feeling around the team than a player’s significant other? Just call it a woman’s intuition. It’s a voice we all should, and now can, hear.